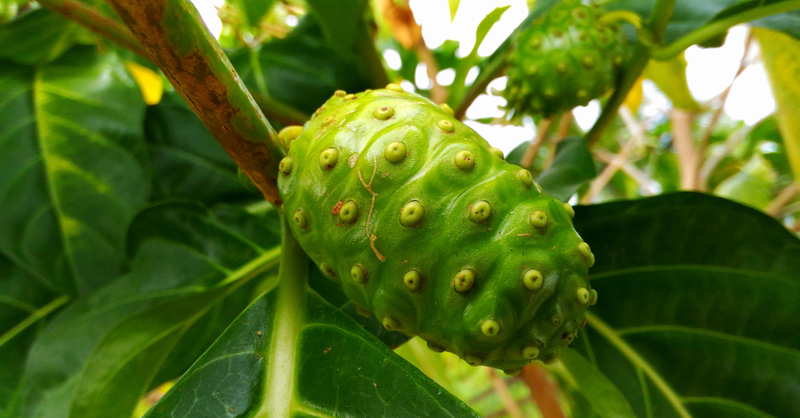 “Traditional Tahitian healers believe the noni plant to be useful for a wide range of maladies, and noni juice consumers throughout the world have similar perceptions,” writes a recent article appearing in the journal Foods. According to the same article, a review of published human studies suggests that noni juice may protect against tobacco smoke-induced DNA damage, increases in blood lipid and homocysteine levels, and systemic inflammation. Most of the scientific studies that have investigated the properties of noni have been recent. In 2003, it was reported that noni inhibited angiogenesis, the formation of new blood vessels that facilitates tumor growth, in ex vivo cultures of human breast tumors.2 Research has revealed cytotoxic activity for an extract of Morinda citrifolia fruit against human neuroblastoma and breast cancer cells.3 Other research found effects for noni leaf extracts in human epidermoid carcinoma and cervical carcinoma lines.4 Damnacanthal, a compound occurring in noni has also shown anticancer effects in human cells.5 These and other studies have led to experimental and limited clinical studies investigating the use of noni against cancer. In mice with Ehrlich ascites tumors, treatment with noni and/or the chemotherapy drug doxorubicin resulted in decreased tumor growth due to the induction of apoptosis (programmed cell death).6 A human study of 51 cancer patients published in 2009 found quality of life benefits associated with noni intake at varying doses.7 Improvements in fatigue, pain and the maintenance of physical function were greatest among those who consumed a moderate dose. In another study that included 203 smokers, a month of noni juice extract reduced blood lymphocyte aromatic DNA adducts, a biomarker of carcinogen-caused damage.8 The authors of the report concluded that noni could reduce cancer risk in smokers by blocking carcinogen-DNA binding or removing adducts from genomic DNA. Topical noni leaf juice has also shown an ability to improve wound healing, which is one of the traditional uses of the plant in Polynesia.19 Another topical use for noni and noni compounds is against cutaneous Leishmaniasis, a tropical disease caused by a parasite.20 A trial involving 50 patients treated with noni resulted in an excellent response among half of the participants and good improvement among 30%. West BJ et al. Foods. 2018 Apr 11;7(4). Hornick CA et al. Angiogenesis. 2003;6(2):143-9. Arpornsuwan T et al. Phytother Res. 2006 Jun;20(6):515-7. Thani W et al. Southeast Asian J Trop Med Public Health. 2010 Mar;41(2):482-9. Nualsanit T et al. J Nutr Biochem. 2012 Aug;23(8):915-23. Taşkin EI et al. Cell Biochem Funct. 2009 Dec;27(8):542-6. Issell BF et al. J Diet Suppl. 2009;6(4):347-59. Wang MY et al. Nutr Cancer. 2009;61(5):634-9. Wang MY et al. Scientific World Journal. 2012;2012:594657. Brown AC. Phytother Res. 2012 Oct;26(10):1427-40. Basar S et al. Phytother Res. 2010 Jan;24(1):38-42. Okusada K et al. Biol Pharm Bull. 2011;34(1):103-7. Harada S et al. Yakugaku Zasshi. 2010 May;130(5):707-12. Nerurkar PV et al. Br J Nutr. 2012 Jul;108(2):218-228. Lin YL et al. Food Chem. 2013 Sep 1;140(1-2):31-8. West BJ et al. J Nat Med. 2009 Jul;63(3):351-4. Serafini MR et al. Biomed Res Int. 2014;2014:587819. Akihisa T et al. J Oleo Sci. 2010;59(1):49-57. Palu A et al. Phytother Res. 2010 Oct;24(10):1437-41. Sattar FA et al. Nat Prod Commun. 2012 Feb;7(2):195-6. Jainkittivong A et al. Oral Surg Oral Med Oral Pathol Oral Radiol Endod. 2009 Sep;108(3):394-8. Wu ZQ et al. J Ethnopharmacol. 2015 Apr 22;164:283-92. Ishibashi Y et al. BMC Complement Altern Med. 2017 Mar 4;17(1):137.